Great. The room was super awesome. Loved the scrabble set and ambiance. Overall experience was excellent except for rooms aren’t soundproofed from the outside and the hallway. Don’t mind hearing people passing by the hallway, but if it’s in the middle of the night and you’re trying to catch some Zzz’s for an early morning flight, situation doesn’t help. I travel 70% of the year globally, when I found myself in Brooklyn for a wedding, I assumed that I would stay at a “typical” chain hotel. The Tillary is truly a hidden gem, from the moment that I step in the doors to the moment I left, the entire team gave their everything, not only with me but I watched them with others. This boutique hotel is located walking distance from all that makes Brooklyn enjoyable, food, history, sites, and the best people watching. My executive room was roomie, clean, comfortable. I look forward to coming back very soon. Our stayed at the hotel was very pleasant. The hotel is located very close to Manhattan and also not far from Brooklyn attraction. Staff was pleasant and accommodating. Door kept slamming all night and the voices in the hallway were loud and constant. You could clearly hear what was going on in the hallway. Not a restful night as the walls and doors seemed thin. My family and I stayed here for my wedding since it was nearby. Staff was very nice and professional, rooms were very small but clean. During our stay the restaurant was under construction so we weren't able to order room service or purchase hot food. My only complaint is that the hotel lobby smells like cheap cologne.. it is so overpowering and can be nauseating..Lastly the rooms didn't have a Microwave and they stocked the fridge and room with snacks/refreshments that were rather expensive.. $3 for chips or snickers, $4 for soda and water. I had a lovely stay at the dazzler hotel. It was a perfect location at Brooklyn area. I could walk to some good restaurants near by and lots of places to shop very close. Stayed there for 5 nights the room was lovely clean environment really comfortable.great staff especially Chris and the lady that did house keeping don't recall her name but she was great .The bellman was really friendly to us .I highly recommend this hotel to anyone. My husband and I recently went for a long weekend getaway in NYC- we wanted to see the city, but we also wanted to visit friends who live in Brooklyn. The Dazzler was a great pick, located at the base of the Manhattan Bridge (and an easy walk to the Brooklyn Bridge, which is worth walking at least partially across for the amazing view of the Manhattan skyline). It was also an easy walk to Downtown Brooklyn, Brooklyn Heights, and about 10 minutes to the train, then an easy zip into the city. I feel like I should mention that I don't ask for much in a hotel; much like Dale Cooper, I just need a clean place, reasonably priced. The Dazzler delivers with cool art deco styling, plus the staff was super friendly- shout out to Stacy in the cafe, who made us laugh and smile every morning. We arrived early (10am) and were able to check in right away, and got a nice, spacious (for NYC) room on the 5th floor overlooking the beer garden. We had no issues with noise, the room was clean, had nice bath products, and the bed was pretty comfy. Thanks to Orbitz, we were given a late (1:00) checkout, which worked out perfectly. We were headed to the airport then, but the staff did offer to store our luggage if we still had time to kill. Overall, we would stay here again! Thanks Dazzler! Very friendly and helpful staff, clean rooms. Becuase of the bridge it gets rather noisy even with windows closed around 5-6am. If you're sensitive to sounds - might want to consider some place else. There is very little vertical space in the closets, so if you have a long coat or a dress it might be difficult to hang. The food in the hotel is okay, but there are plenty of places around. In general, I thought it was a decent deal for the price paid. I enjoyed my stay and will stay again. It is a very hip and sophisticated place. At around 5pm the hotel staff were screaming and behaving very unprofessionally as they cleaned my floor. It's in a slightly awkward location, but worked perfectly for what I was doing in Brooklyn. No fee parking. Only pay parking. Long walk from the nearest subway station. It was a nice hotel, and the staff was very helpful. Overall it was a very nice stay. 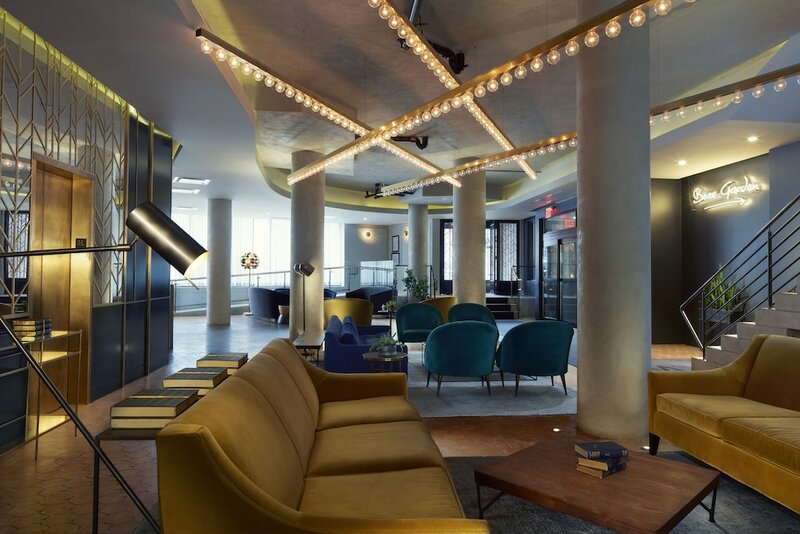 Located in Downtown Brooklyn within a short walk of Brooklyn Bridge Park, The Tillary Hotel is within a mile (2 km) of other popular sights such as Barclays Center Brooklyn. This 3.5-star hotel has 174 rooms and welcomes guests with a bar/lounge, a 24-hour fitness center, and free in-room WiFi. For your convenience, a continental breakfast is available for a fee. Savor a meal from the comfort of your room with room service, or entertain your taste buds with a beverage at the bar/lounge or coffee shop/café. Guests can expect to find 42-inch an LED TV with satellite channels and pay movies, along with free WiFi and wired Internet. Beds sport premium bedding and the bathroom offers a hair dryer and free toiletries. Other standard amenities include a coffee maker, free local calls, and a safe. Built in 2015, the brand new The Tillary Hotel features a 24-hour fitness center, a rooftop terrace, and free WiFi in public areas. Valet parking is available for USD 50.00 per day, and there's also limo/town car service. Multilingual staff at the front desk are standing by 24/7 to help with dry cleaning/laundry, concierge services, and securing valuables. Additional amenities include a conference center, a 24-hour business center, and a computer station. Thank you for your valuable feedback. While we are pleased to read that you had a positive overall experience, we are sorry for any issues with noise that you encountered. Our team really values your constructive insight and we hope that you were able to rest well despite any discomforts. It would be our pleasure to welcome you back so that we can find the perfect room for you in the future. Dear Jodi-Tatiana, Receiving feedback from a seasoned traveler such as yourself means all the more to us here at The Tillary Hotel! It excites us that our commitment to service with a smile impressed you, and we're glad you were able to easily explore the sites of Brooklyn on foot. It was our pleasure to make your stay not only comfortable, but enjoyable as well, and we look forward to your return visit! Our team at The Tillary Hotel would like to thank you for choosing to say with us during your recent visit to the area! We're thrilled to hear that you enjoyed the beautiful views, and we're so glad your accommodations were clean and comfortable as well. Thanks again for your review, and we hope to see you in the future! Thank you for choosing The Tillary Hotel! It's an honor to receive your outstanding rating. We're delighted that you were impressed by our spacious accommodations and attractive decor. We trust that all other aspects of your stay were enjoyable as well. Your kind praise is much appreciated and we'd love to host you again. Beer Garden - Bar. Open select days. Recreation features at The Tillary Hotel include a 24-hour fitness center.